There are hazards that we’ve all heard of when it comes to beer, and it goes doubly for when you are making five gallons of it for relatively cheap every three weeks. 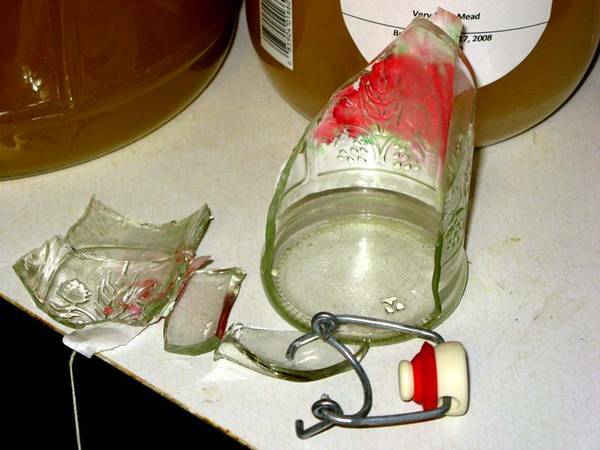 However, a unique hazard that isn’t well known outside of homebrewing is that possibility of bottle bombs. Many homebrewers and some commercial brewers carbonate their beer by letting the yeast undergo another fermentation in the bottle. Some amount of sugar is added to the beer before the beer is transferred to the bottles and the bottles capped. The bottles sit at room temperature for a few weeks while the yeast eat the sugar and fill the headspace of the bottle with CO2. Cooling down the bottles in the fridge allows that CO2 to dissolve into the beer, making it carbonated. However, before this cooling and dissolution occurs, the bottle is under high pressure. How high? High enough that I’ve read stories about glass getting embedded in dry wall and neighboring bottles also exploding. Definitely high enough for injury. Bottle bombs happen for a few very preventable reasons: infection, bottling before primary fermentation is complete, faulty bottles, or using too much priming sugar. I suspect they can also happen for a slightly more insidious reason which is ambient temperature. Gasses expand under heating, so a bottle which can hold a certain volume of CO2 at 70 degrees may not be so resilient at 80 degrees. Today I got a text from Jason saying he found a puddle of beer on the floor near where I store my bottles. When I got home, Jason had cleaned up the puddle, but I found this bottle. 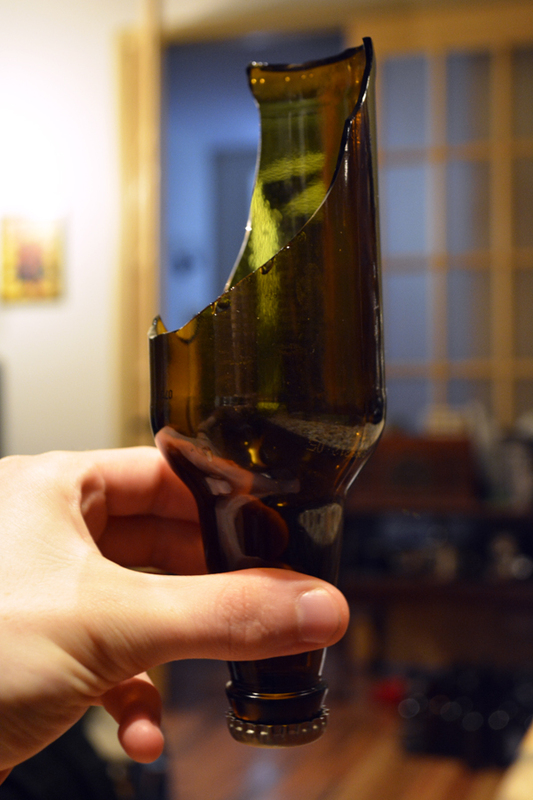 The side was not only cleaved, but the remainder of the bottle had fragmented into smaller pieces, so I imagine it exploded with some force. Jason said he might’ve heard a bang earlier but had disregarded it. The damage was very contained and nothing around it seemed to be affected. It was a bottle of Schnellweisse, which I’ve more highly carbonated than any previous brew. I don’t know if the batch is done carbonating yet, as it’s only been half of the length of time I usually give them, but I’ve put one in the fridge to try in a couple days. If they seem sufficiently carbed I’ll move many more into the fridge and hope for the best. This entry was posted in beer, learning and tagged bottling, fermentation, temperature, weisse on July 3, 2013 by Dylan Bargteil. Warn your fridge food to wear protective gear. That beer doesn’t play fair! Fortunately since the solubility of CO2 in water increases as the temperature decreases, once I put the beer in the fridge the CO2 will dissolve into the beer and the pressure in the bottles will diminish.